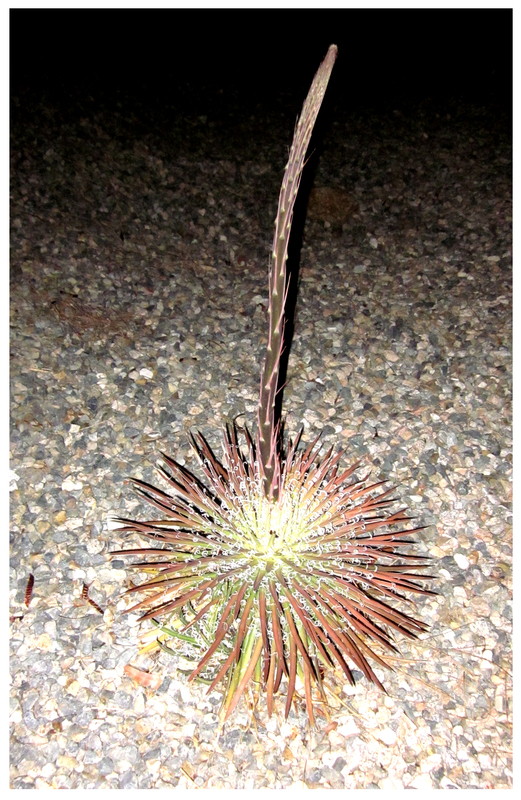 … then, the stalk was almost 8-inches long. I couldn’t believe what I was seeing; I’d never considered this type of agave the stalk-producing type. 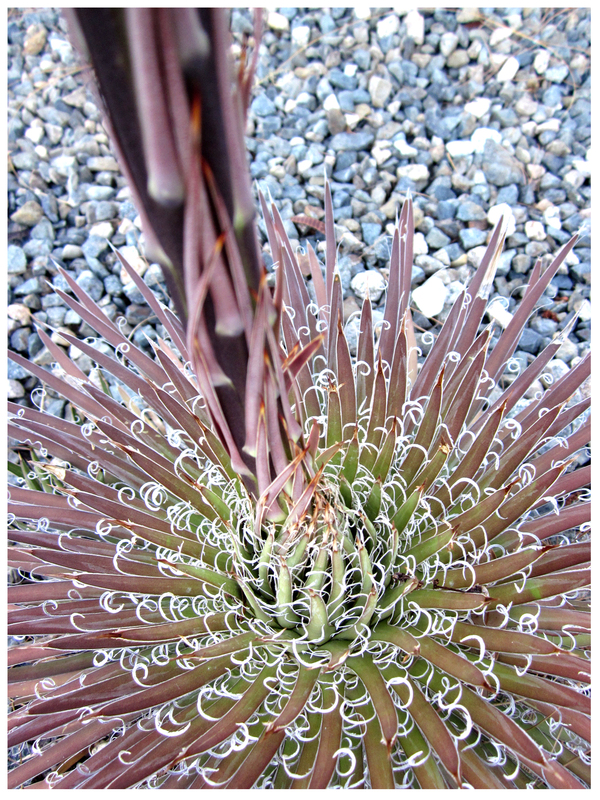 One of my favorites, agave multifilifera possess an unexpected appearance that includes contrasting coloration, rigid porcupine quill-like spines (which are devilishly sharp!) and the filifera, or small, curly, white fibrous ‘hairs’ that edge the quills …. and, there are tons of them, hence the name multifilifera. Adding the stalk to the list only makes me love this plant even more. Taking a really close look at the base of the stalk, it looks like the quills have formed a vortex that had nowhere to go but up … more than tripling in length, in less than a week. I’ll be monitoring this agave’s stalk progression, hoping it will produce the pink/green flowers I’ve read about online. Interestingly, this agave hails from Mexico’s higher elevations, but its location at the Rancho is anything but, being at one of the lowest points here … Whatever, I’m just delighted it’s so happy where it is. 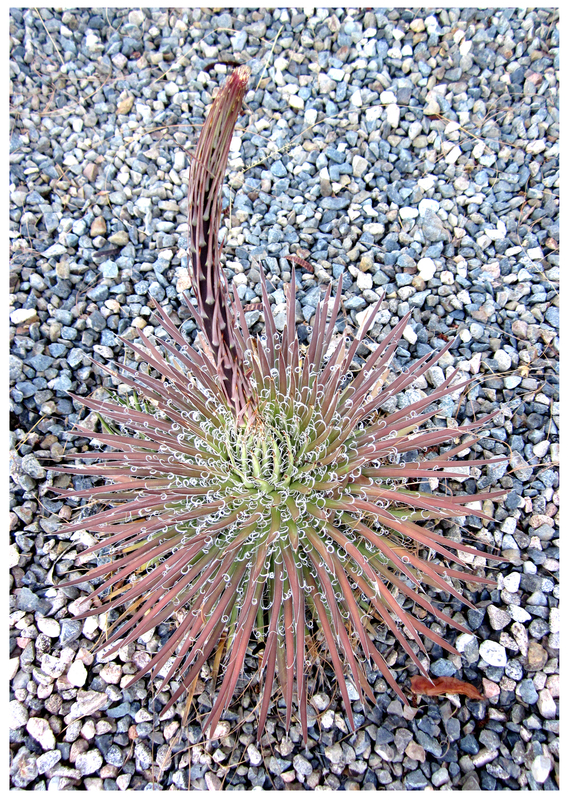 Coincidentally, it was at this time last year that my agave potatorum decided to put on a stalk show, too … if you missed those posts you can begin to read them by clicking here. In the end that agave’s stalk reached an amazing height of 90″! I don’t have the same expectation of my much-smaller multifilifera; online notes say its stalk should reach only 16″. It’s already surpassed that, however, so who knows?! Agaves evidently have minds of their own when it’s stalkin’ time. And, I wouldn’t have it any other way. Mesmerizing ~ I feel like all it’s little hairs are tickling me is this spiral of life. The night shot’s make me feel like a deer caught in some headlights. It is fascinating… I hope it flowers! This world of plants just keep giving such wonderous surprises!! I just keep wanting to go to some of the places you’ve shown me here and on to others. Same here, Vicki… when I was a kid I hated yard chores and now they’re my favorite thing in life. Well, maybe not in 100ª weather but, you know! Succulents do have a way of surprising, one of the reasons I love ’em so much … Whether it’s changing to an entirely new color, sending up a way out of proportion flower stalk, or shape-shifting from spindly to broad, I’m hooked on their natural beauty! Nice show! Do you know if the flowers will turn to tiny plantlets like on some agaves? HI, Loree, I don’t know if those plantlets will appear; i saw reference to pink/green flowers only… I checked the agave again this morning and it’s grown more … overnight!